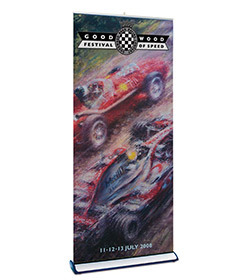 Banner stands are portable displays that hold a custom printed banner graphic in place to be seen by people passing by. They are a cost effective way to present your promotional message and are used effectively at exhibitions, in retail and other marketing environments. Banner stands, also known as stand up banners, are our most popular portable stands for good reason. They combine affordability with a large graphic area and can be used anywhere. 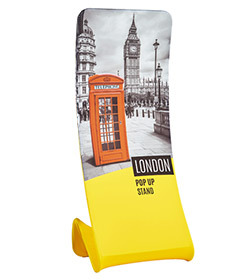 We have hand picked a selection of the best pop up banners, tensioned stands and outdoor banner displays in order to offer you the widest choice available on the internet. Need help on the differences between our types of banner stand? Check out our guide below. No artwork? No problem! 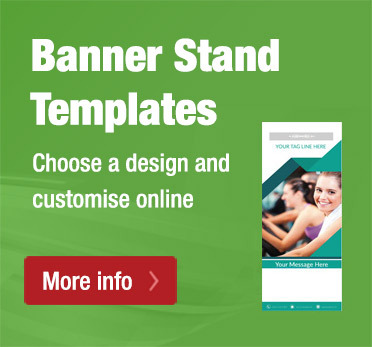 Use our bespoke banner design service, or you can browse our range of pre-designed banner stand templates and customise instantly using our online design tool. Great value retractable banners - simply pull the graphic up from the base to display your custom printed message. Lightweight and easy to use, assemble the frame and then attach the custom banner graphic to keep it taut. Designed to withstand the elements, these outdoor bannerstands are rugged and waterproof. 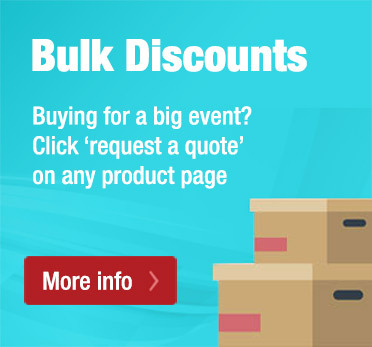 Exceptional value banners that have quick change cassette graphics. Swap your custom printed graphic in seconds. With a custom printed graphic on each side of the stand, double sided banners are ideal for getting maximum visibility from your display. Roller, tensioned, fabric & outdoor options. No design? No problem! Professional banner stand design service starting from just £19. 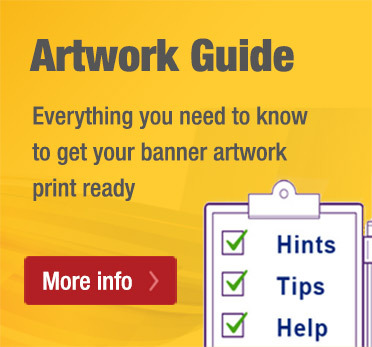 Our team will create a stunning banner graphic that is ready to print based on your brief. We sell thousands of banner stands a year, be it roller banners, tensioned or outdoor banner stands. We like to think it is because we offer the very best value for money and a great service. Choose Discount Displays for reliable hardware and vibrant high-quality graphics. All our tensioned and pop up banner displays have been chosen for portability, ease of use, durability and value for money. With the flood of products on the market, choosing the most suitable portable display for your next exhibition can be confusing, but we are here to help! Just call our team of experts on 0844 800 1020 for advice on choosing the right stand for your requirements. We import a range of exclusive systems and our printing takes place in-house in a state of the art large format print department on the outskirts of London. Printed banner stands are ideal for use at exhibitions, trade shows, conferences, promotional advertising or anywhere else where your business needs a display graphic with impact. Our stands have been tried and tested over several years and have outstanding reliability and backed by a hardware guarantee up to 10 years. Not only is quality assured but you get your trade show and display graphics fast. What is a retractable banner stand? 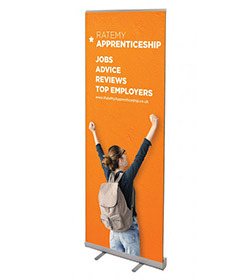 A trade show favourite, also known as pop up, pull up or roller banners, this freestanding display comprises a base with an interior spring mechanism. This creates tension to pull the graphic into the base when it is not in use and keeps the banner under tension when it is put up. In effect, it is an upside down Venetian blind. They are generally available as single or double sided displays. Economy versions will use printed PVC, whereas more expensive models will use a blackout polyester with a protective overlaminate. 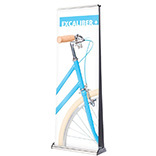 What is a replaceable cassette banner stand? A more expensive version of the standard retractable banner, with the added advantage of a replaceable cassette. This allows you to change the message easily as the graphic simply pops out of the base. Replaceable cassette bannerstand graphics are printed onto an Opal Jet polyester based material which delivers exceptional print quality. It will be finished with an anti-glare protective overlaminate. When to use an outdoor banner stand? Plenty of people use their indoor banners outdoors, but this significantly impacts the durability of the stand. A little bit of wind and they will blow over, tie them down and the pole will bend or break. Stands specific to outdoor use are designed to put up with all manner of weather conditions. They can either be a roller pull up type or tensioned types. Both will incorporate a heavy base and stronger poles, as well as a mechanism for allowing the wind to spill from the banner. PVC banner material is used on outdoor banner stands since it is waterproof and can be rolled up. What is a tensioned banner stand? A simple alternative to retractable models, also known as X banners. 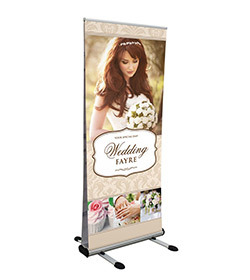 Tensioned banners are lighter and cheaper than retractables, making them ideal for promotions that need larger orders. They don't have any moving parts and changing the banner is simplicity itself, but they take a couple of minutes more to put up. PVC banner material is used for the majority of tensioned graphics. Can graphics be printed double sided? Not all stands can take printed double sided banners. Check out our range of double sided stands, where we have roller, tensioned and outdoor options available. How long do the stands last? That depends on how much use the banner stand gets and the model. One influencing aspect is how much the stand is used and how well it is looked after. Each product page will tell you what guarantee the hardware has. Are they for indoor and outdoor use? The majority of our models are for indoor use. For outdoor use, we would always advise that you buy an outdoor banner stand, which can withstand the elements. No, they are all tool free assembly. Is the banner easily scratched? Our banners are scratch resistant, but all graphics need to be looked after to some degree. PVC banners are printed with scratch resistant latex inks and all other banners are protected with a scratch-resistant laminate. Does the base protect it during transportation? On the retractable type, the graphic rolls up into the base and is totally protected. On tensioned models, the graphics can be stored and transported in a carry bag. Can you design it for me? Yes, we have set price design packages starting at just £10.99. Alternatively, we have a free online design tool. Choose a template and personalise it online in a matter of minutes. It depends on the product model and how quickly you approve the artwork proof that is sent to you. Most stands take between 3-5 working days. If you have a tight deadline it's always worth calling, if you are in a rush we will bend over backwards to help you.